We all struggle with body image and for most of us, there’s something about our body we’d like to change. It isn’t always easy for us to accept ourselves and to be confident with who we are and how we look. So as women, we try every fad diet out there to be comfortable in our own skin cuz lets face it Spanx are uncomfortable! But let’s face it those fad diets are what’s keeping you in those Spanx. So let’s get out of those Spanx for good and start having a healthy relationship with food. Our bodies have some pretty loud cues that let us know when to eat and when to stop eating. But at some point, we stopped listening to our bodies. Take the time to appreciate what is on the plate by looking, tasting, and smelling what you’re eating. In time, your brain will start signaling to your body that it’s satisfied and you’ll be less likely to overeat. 2. Eat Everything! Yes, Everything! It isn’t food that’s good or bad, it’s our experience with food that leaves us with these feelings. If we take the time recognizing the foods and eating situations that we find pleasant, we can help you change the way we eat. Instead of feeling like you have to eat a certain way or you can’t eat the thing you love choose to eat for nourishment. When eating for nourishment you can Eat Everything! We all have those moments when we want to pig out on mozzarella sticks, pizza, and even cheesecake. However, if you do decide you’re in the mood to pig out pick a time when you’re not that hungry so you don’t overdo it. This trick will help you enjoy the things you love while maintaining a healthy relationship with yourself and the food you love. 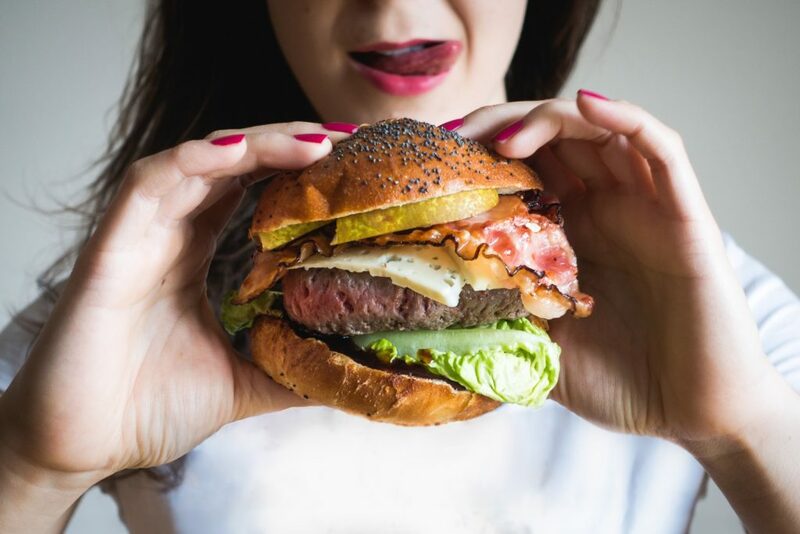 If you know there are certain foods you tend to binge on you can do small things to find the right balance to still enjoy these foods without binging. First of all, stop keeping these tempting food in the house. Instead, if you really love ice cream treat yourself, go out for some frozen yogurt and simply enjoy it. When you order dessert at a restaurant you know once you finish the dessert your done, as opposed to sitting at home having one spoonful after another straight out of the carton. To avoid devouring a whole carton of ice cream or a bag of chips, try buying single-serving packages of your favorite things. So many times we forget to take the time to eat, and eating does take time. Looking ahead at your day and set aside some quality time to eat, rather than scarfing down something in between your hectic schedule. Giving yourself permission to enjoy eating and your body will thank you. We all find ourselves in situations where we don’t make the best food choices and end up feeling guilty. When this happens there’s this initial feeling that we need to make up for eating poorly by killing ourselves at the gym or over restricting ourselves the next time we eat. Instead, forgive yourself and for your next meal get back on track. Rather than restructuring what we eat to make the number on the scale change we need to eat foods that make us feel good. We need foods that nourish us to give our bodies the energy to fuel our daily activity. By fueling your body with healthy nutritious foods, the scale will move in a positive direction. The key to living a healthy lifestyle is balance. If you are too rigid, restrictive or strict about nutritious eating you could actually be setting yourself up to fail. This is a JOURNEY and we need to ENJOY the journey as much as we can. The more you can ENJOY the journey the greater the chance that you are going to sustain what you are currently doing and sustainability is the key. Eating food should not be the way we measure involvement in an activity. You need to remind yourself that you’re not there for the food you are there to have a good time, socialize, make memories. 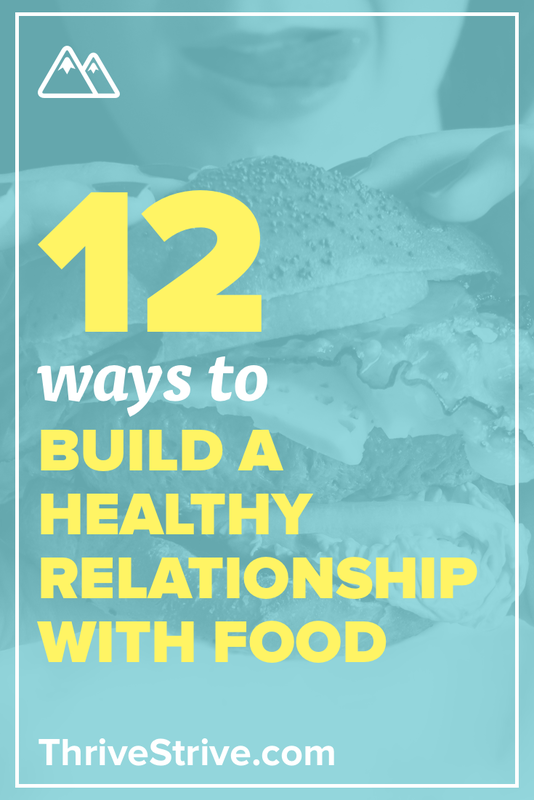 Enjoyed 12 Ways to Build a Healthy Relationship With Food? Share it with your friends so they to can follow the Thrive/Strive journey.